Rosehaven Cottage: Just call us "Cluck Med: Vacation Paradise for Poultry"
Just call us "Cluck Med: Vacation Paradise for Poultry"
Just as mysteriously as she showed up, the chicken (aka "The Big Ging" or "Ginger") went away some time on Sunday while we were away all day visiting family not far away. She was wandering the garden all day on Saturday, but by Monday there was no trace of her in the garden. I haven't seen her since. 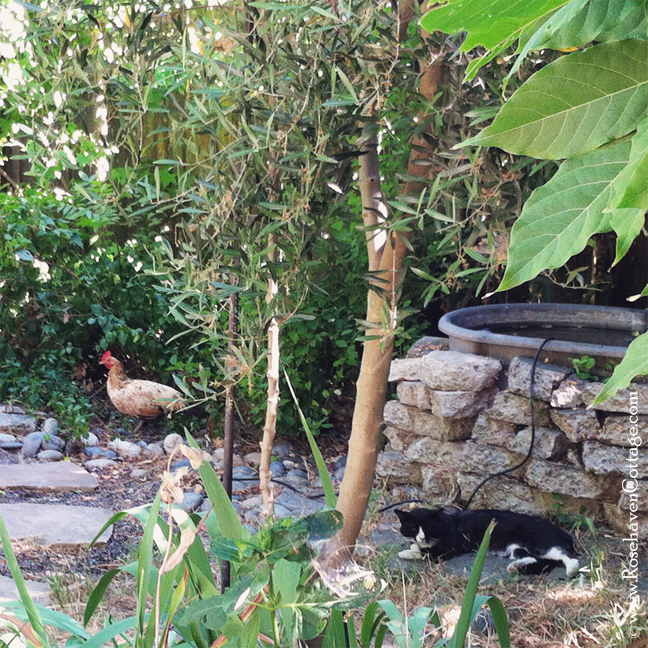 In total, the chicken stayed here for about 10 days eating lots of bugs, taking naps in the shade (even if it was only a few feet away from a cat), dusting herself in the dirt of the strawberry patch, and preening her feathers to make them look nice and glossy. She gained enough weight over that time period that she looked really healthy. I could tell by Saturday that she was getting bored with the offerings here. Even though I put out chicken scratch (a mixture of cracked corn, wheat, oats and millet) for her everyday, she wasn't impressed and didn't like it. She would pick around the corn and leave the corn on the ground for other critters. I tried giving her shelled sunflower seeds. She liked them at first but then went back to foraging for bugs. By Saturday, she was wandering around the house to the front garden and foraging there. Apparently, she had gleaned all she could from the larger back garden. The good news is that even though when she showed up she had diarrhea, after a few days here she was getting healthy and no longer having digestive problems. Once she started into marathon preening sessions while laying in the shade, I knew she was on her way to being a happier and healthier chicken. She stayed here about as long as someone stays at a resort spa--relaxing and detoxing from real life. Maybe she was on vacation and we were her "resort spa". Just call us "Cluck Med". P.S. Despite my joviality in the above post, I'm sad she's moved on. I will admit I shed some tears yesterday when I didn't have a chicken to entertain me as I sat in my chaise lounge getting my outdoor R&R. I hope we get another "guest" soon. This makes me a bit heartsick. I had visions of Ginger becoming a permanent resident at Rosehaven Cottage. I mean...if I were a random chicken that's what I would do. I'll miss reading about her antics in your gardens. I've been heartsick about it since I toured the garden yesterday and saw no sign of her. I never thought a chicken would leave me feeling so empty and sad at her exit. Tears came easly yesterday. It's better today. How lovely that she chose your garden to recuperate in. It speaks volumes about the space you've created that a 'wild' animal would seek safe haven there. Take solace in the fact that she felt comfortable enough there to relax and do chicken-things within range of you and your cat. Perhaps, after she's been out in the scary world for a few days, she'll return to set up permanent residence in your backyard. But I totally understand where you are coming from, Phil doesn't visit as much now a days as he did. I miss him too. Thank you, Carolynn and Jen! I've had this tug-of-war going on with my head and heart since Monday. And I have to remember the things that Carolynn has so eloquently written. As I've researched the behavior of wild chickens (aka "feral"), I've come to realize that she truly was a wild animal in every since of the word. Her behavior matched that of other established wild chicken colonies that have been observed. They are savvy survivors that aren't used to humans. A close friend who's a chicken expert told me that it is very possible for a domesticated chicken to get loose, mate with a wild rooster or lay fertile eggs from the rooster at her home and hatch her chicks in the wild to create a new generation of wild chickens. Chickens can go from being domesticated to wild in one generation. Like Jen's Phil, the pheasant, "Big Ginger" just happened to be passing through as she saw fit. And it is very likely that I'll see her from time to time just like Jen sees Phil. I love love love that a chicken just showed up in your bird-welcoming-resort of a yard. Rosehaven really is an oasis in the desert and I'm glad your little chicky had a safe sanctuary for her vacation. I understand how sad you must be that she is gone, but what a fun time while it lasted! I've only ever had trouble-making critters seek out my yard. Oh Cody! Your words have warmed my heart!!!! I'm glad you were able to spend time with her and that she chose your space for her spa. But I'd be sad, too, if she left.